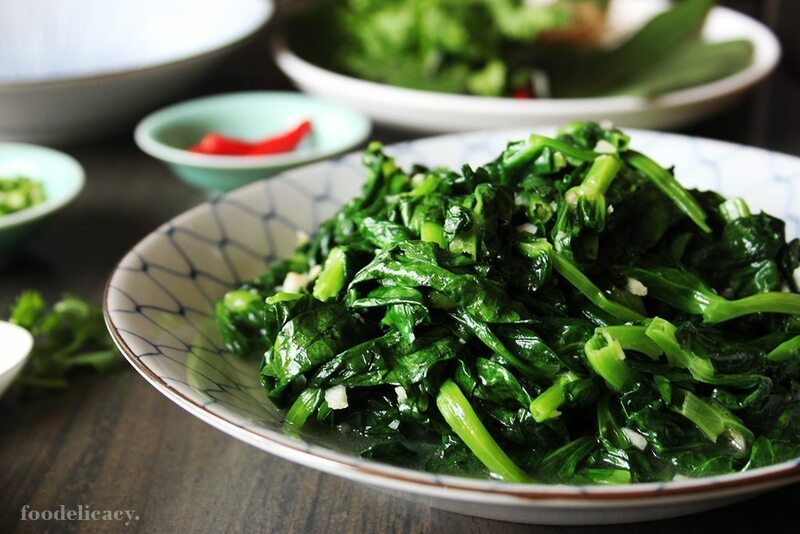 I found love for green veggies like no other when I was introduced to pea shoots, or dòu miáo (豆苗) in Chinese, soon after settling down in Singapore, some twenty-odd years ago. 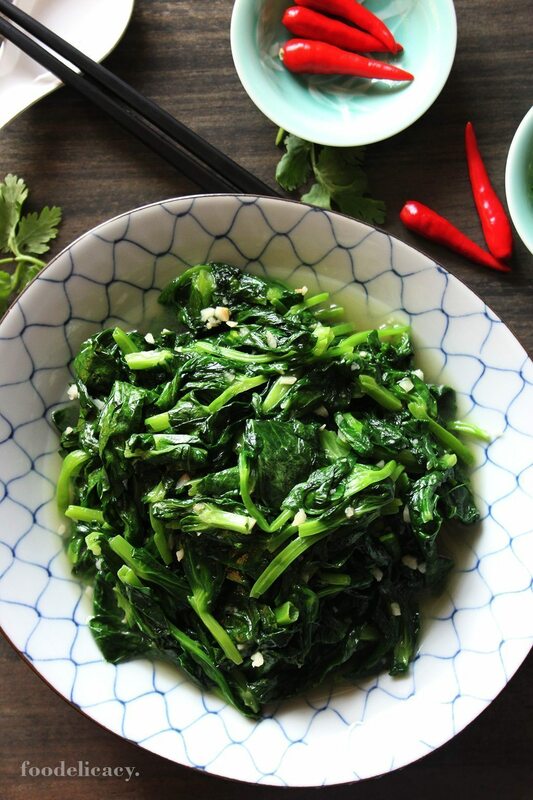 It’s an eternal love affair, as time has shown, for I never tire of this delicate, nourishing and nutritious Asian vegetable, and whenever it’s available at my usual tze char eating places, or at Chinese restaurants, it will usually be my first choice of a vegetable dish at the table. But given how prices of restaurant meals have creeped up over the years, it seems almost sinfully wanton to pay so much for a vegetable dish that you can easily, and in a matter of minutes, cook at home, and costing you just a fraction of what you would have to fork out. I don’t know about you, dear readers, but it’s hard for me to part with hard-earned money, especially when I am aware of the costs of raw ingredients, and even more so, when it’s for meals I know I can prepare at home. So, here is a delicious and incredibly simple stir-fry of pea shoots with garlic that doesn’t require any skill, really. Pea shoots (dòu miáo – 豆苗), which also goes by many names, namely snow pea shoots, pea tips, pea vines or pea stems, are the tender, growing tips of the edible, mature pea plant, primarily consisting of the several top leaves, stem, and tendril which forms at the end of the vine. Pea shoots are different from pea sprouts, the latter being the variety that is more commonly available in Singapore, as these are easily grown or cultivated from dried raw pea seeds, in our tropical environment. Pea shoots are delicate, nutty, crunchy, and juicy, not unlike spinach, but so much more pleasant, without the grit and characteristic astringent effect that spinach (due to its high oxalic acid content) tends to leave on our tongues. What I love about this Asian vegetable is that the young stems are just as tender as the leaves, when cooked, so you don’t really need to throw away any part (unless the stems are really toughened or thick, and leaves wilted or soiled, of course). Here in Singapore, pea shoots are less commonly found than pea sprouts, but we can still get them at our wet markets when these are in season. I can’t quite yet put a finger on when pea shoots are in stock, mostly from Taiwan, so I’ve been told by the vegetable vendors at the market. So when I see pea shoots, I typically grab 3 to 4 packages (each roughly containing 150 to 175 gm) at a go, and shop for these at least 2 to 3 times a week! That’s just how much I love pea shoots! This recipe is as simple as it gets, but works so well with either pea shoots or pea sprouts, or most Asian greens for that matter. For a more enjoyable eating experience, try to snip, or break with your fingers, long pea shoots into bite-sized portions, roughly 1-inch (2-cm) sections, with leaves attached to stems, or shorter stems. Now all you’ll need are just 3 other ingredients to make this tze char version of stir-fried pea shoots with garlic. The key to a flavourful stir fry, in my opinion, is to go all out with the garlic, especially in this dish! 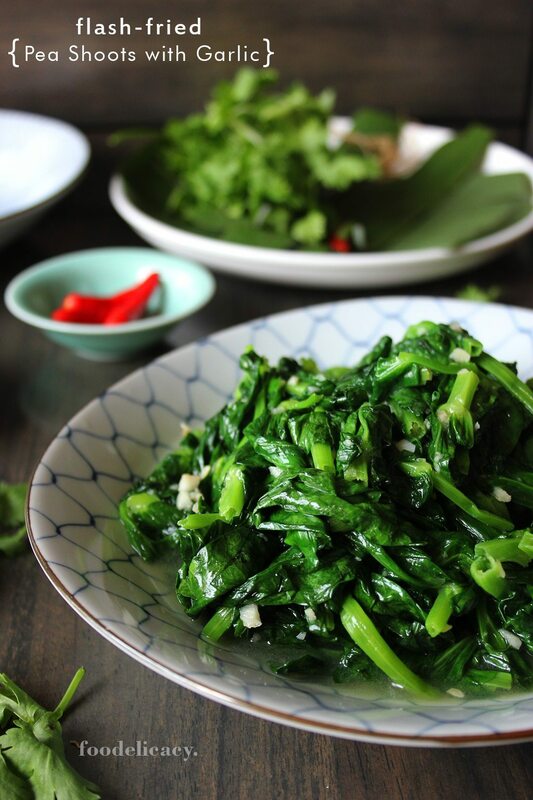 An incredibly simple, easy, and fast stir-fry recipe for tze char style flash-fried pea shoots (dòu miáo 豆苗) with garlic, Chinese style. Snip or break with your fingers, pea shoots into bite-sized segments, roughly 1-inch in length. Wash thoroughly, drain, and set aside. Heat up a wok over high heat. When wok is smoking hot, add oil. When oil is very hot, add chopped garlic and fry for 10 to 15 seconds until fragrant. Add pea shoots all at once, and toss lightly for 20 seconds, then add chicken seasoning, salt, and Chinese wine (optional). Add a little hot water, if you like, (the steam generated when it hits the hot wok will help to quickly cook the pea shoots), and continue to stir fry for 1 minute, or until the shoots are slightly wilted, but still bright green. Transfer to a serving plate or dish, leaving behind some, or most of the juices, if you wish. Serve immediately. Hi Helen, thank you for writing in!? You might be familiar with chicken bouillon cubes where you are? They’re the same except that they are also available in powder or granule forms. You can use the cubes, but need to adjust the amount to be added to your stir-fries to suit your taste, as the cubed form is a little more concentrated, in my humble opinion.?? Hi Celia. I love pea shoots and am so excited to make them at home. What do you mean by chicken seasoning? Is is a prepackaged mix or can I make it with my own spices? Hello Sukhjit, thank you for asking! I always bought packets of these from the wet markets in Singapore, and these are usually packed by the vegetable stall vendors so I’m afraid there’s no label that I can refer to ?, sorry to say. I’ve not ever seen these sold in supermarkets. The veggie vendors say these come in only seasonally and are dou miao from Taiwan. I always buy these from the Tiong Bahru wet market.? Hi Celia,Awesome! I live this dish too but like you said in Sgp they’re selling sprouts not shoots which is not the real deal.Can you tell where you buy the shoots and what is the name shown on the packing certainly they don’t mention Dou Miao,sadly. Hi, Celia, Thank you for posting your excellent recipes — the ingredients alone give the aroma of the promised delicacy. Thanks, Celia. I am trying to follow your tempting recipes.